I’m writing this post because of my absolute need to help all furry animals out there who are sick and/or don’t have homes; those furry friends who have been hurt and abandoned by others. 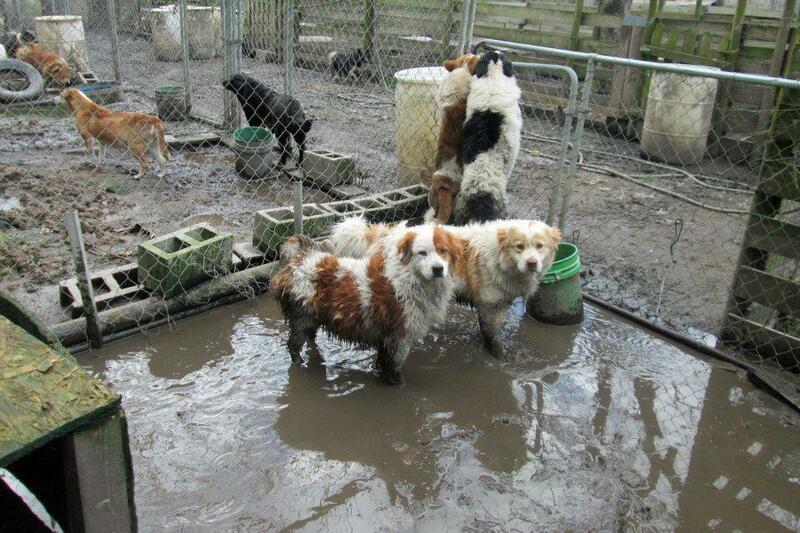 One of my favorite rescue groups – Big Fluffy Dogs Rescue desperately needs all of our help. Every little bit helps. I hope you can find it in your heart to help out even if it’s just a little. It all adds up. This was written by one of the moderators of the Big Fluffy Dog Rescue Group and I’m just passing it along in hopes that more people will see it and help. They did not ask me to pass this along – this is me passing it to you on my own. Fans, we need help again. This rescue gets an A+ in giant heart for dogs, but it gets an F- in timing as we have no business taking on a massive case right now. Since we don’t listen to reason, we have six dogs coming now from a God-awful hoarding case in Mullins South Carolina, that are lovely, sweet scared Great Pyrenees mixes. Ordinarily, not a big deal. However, all six of these of these dogs are seriously heartworm positive and need immediate treatment. The picture below is where they came from and it’s just lovely of course. We are facing $3000 for the heartworm treatments for these dogs alone. Add to it, the geniuses in our pharmaceutical industry have manufactured a shortage of a baseline drug used to treat it so that what cost $4 for a month’s work of doxycycline now costs $200 and you have a very expensive endeavor. I am sure they are congratulating themselves on their ability to make serious money on a generic drug, but I digress. Then tack on the boarding of these dogs since we have no room anywhere. If you want to know how to make me hyperventilate, call me and tell me we have six heartworm positive dogs due for treatment immediately. This is all on top of last week’s $6000 shelter dog rescue from starvation event with Warren County and we are very poor now. These are the days when I wish we rescued only healthy happy animals. I’m sure they exist. Right next to the unicorns at the shelter. If you would like to donate, you can do it here: http://bigfluffydogs.com/pay-online.php. If you would like to foster any of these dogs or others, email jean@bigfluffydogs.com (or katia@bigfluffydogs.com in New England or melissa@bigfluffydogs.com in Chicago/IL). Thanks. This entry was posted in Furry Friends and tagged big fluffy dogs, Dog, dogs, donation, Family, foster, Great Pyrenees, help, Pet, rescue, Rescues and Shelters, tax deductible by tiannafonz. Bookmark the permalink. How sad. I hope they find their funding.